My better half and I wanted to have a healthy meal tonight. We have been focusing on fitness lately. 😉 I saw Spinach in the refrigerator but plain spinach sounded a little boring. 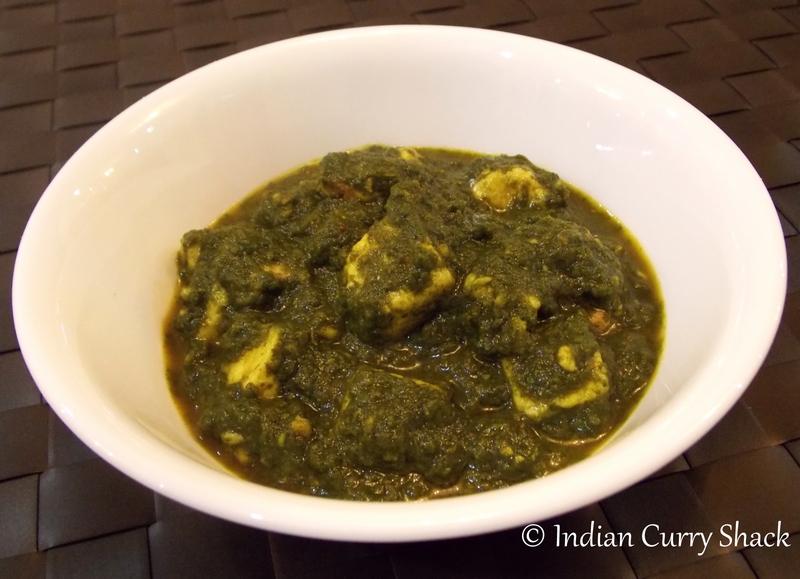 So, I thought of adding some Cottage Cheese cubes to the Spinach and making the two into a popular Indian delicacy ‘Palak Paneer’. Grind spinach with 2 tablespoons of water and keep aside. Heat oil in a non-stick pan, add green cardamom, black cardamom, cumin seeds and cloves and sauté for a minute. Add onion and sauté till browned. Add garlic and ginger paste and sauté for a minute. Add turmeric powder, red chilli powder and coriander powder and mix well. Add salt, tomato and green chilli purée and cook further for five minutes. Add the Cottage Cheese cubes and stir for two-three minutes. Add ground spinach and garam masala powder and mix well. Cook for three-four minutes. Add the tablespoon of milk now and give a nice stir. Remove Cloves and Cardamoms (if you find any). After this step, what I did (which is not necessary if you are making a Palak Paneer) was added the secret ingredient ‘White Button Mushrooms’ – diced and tossed separately in a pan with some salt an d black pepper powder. I added it to the mix of Spinach and Cottage Cheese. The dish became tastier and because we wanted to go for a healthy meal, it was exactly what we wanted and we licked our fingers. You can serve it hot with chapati (Indian bread) or steamed rice.